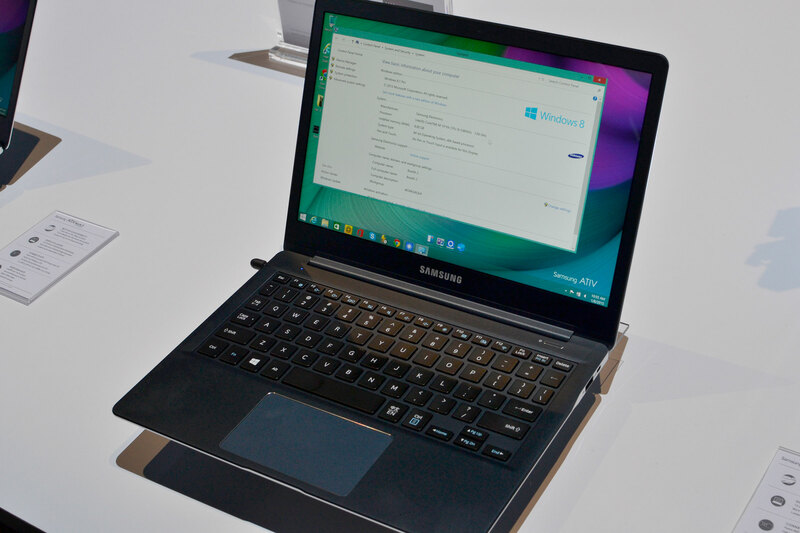 Perhaps the most interesting aspect of Samsung’s booth is what they weren’t showing: laptops. They had exactly one laptop on display, the new ATIV Book 9 with Core M-5Y10c – that’s the configurable TDP “c” variant of Core M, which allows the manufacturer to target different power levels. In the case of the 5Y10c, it can target 3.5W and 6W as well as the default 4.5W, allowing for lower performance but potentially increased battery life (or at least less heat) on the one hand, and higher performance but more heat (and potentially less battery life) on the other. On paper, the configurable TDP mostly affects the base frequency, with the default being 800MHz and TDP down dropping that to 600MHz while TDP up bumps it to 1GHz – the maximum Turbo Boost remains 2GHz in all modes, as far as I’m aware – but for sustained workloads the TDP should also affect what Turbo clock the CPU is able to maintain. 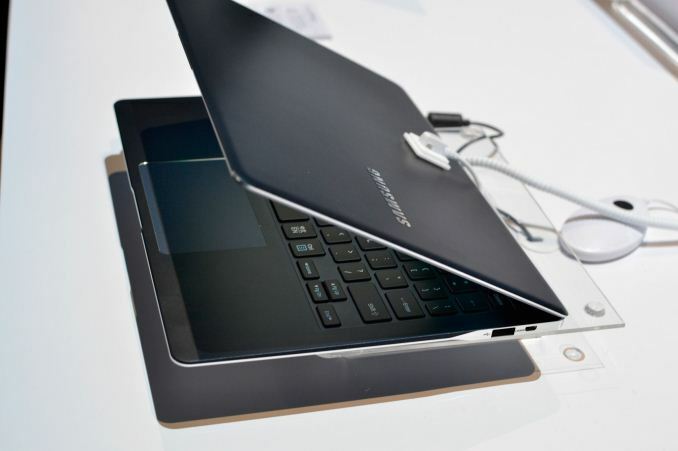 The laptop itself is quite sleek, with hints of the MacBook Air school of design, and Samsung is boasting of battery life of up to 12.5 hours. Connectivity consists of two USB 3.0 ports (one with sleep charging), a headset jack, a micro-SD slot, and one micro-HDMI port. The display is also a nice looking 2560x1600 panel – yes, that’s a 16:10 resolution for a change – which is the same display used in the Samsung Galaxy Tab/Note Pro 12.2. I have to admit that it’s still rather frustrating that other than Apple, all laptops are generally now on 16:9 aspect ratio displays while most tablets remain at 16:10, but I digress. The latest ATIV Book 9 should be shipping soon (it’s listed as preorder/out of stock on at least a few sites), with pricing of $1399 for 8GB RAM and a 256GB SSD. The remainder of the Samsung booth was mostly products that have already launched, with a lot of tablets and phones on display. 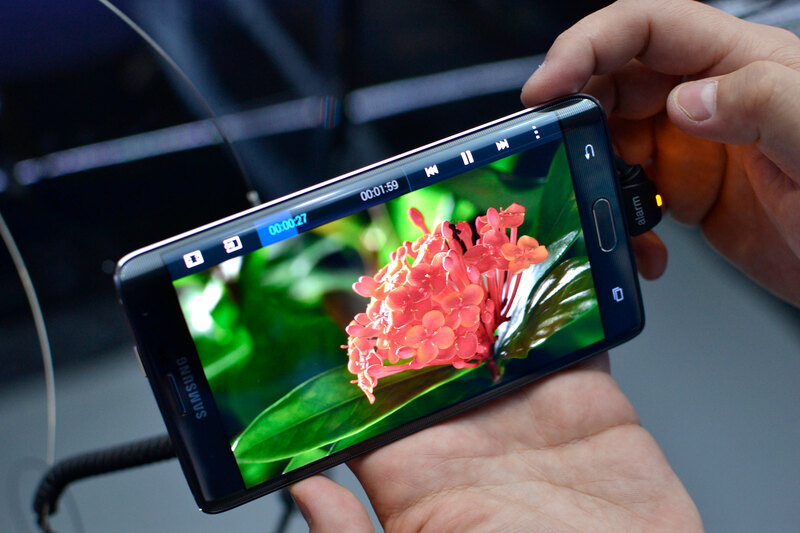 There were a few non-US phones (the A5 and A3), and the Galaxy Note Edge that has an OLED with the curved right side ostensibly used for notifications and other items that looks interesting but may not be particularly practical. The Galaxy Tab S tablets were also present, along with the ruggedized and waterproof Galaxy Tab Active. Of course it was fun to ask the booth attendants about the hardware only to be told “we’re not making that information public yet” – particularly unhelpful since the products are already on store shelves. The Tab Active is equipped with a Snapdragon 400 if you’re wondering, so it’s more about being rugged than performance, and the price as usual for ruggedized products is quite high. Of course Samsung had a ton of other products on display, including displays, HDTVs, All-in-One PCs, and more, but our primary focus was on the above categories for this CES. i like the 16:10 screen here, although on 12 inches even a nice 1200p panel would have been enough for my taste. the price is too damn high though and ideally they should offer a version with 512gb too. i'm still on the fence about the performance of core-m though. turbo-clocks don't look half bad, but if they're only sustainable for a couple seconds at a time that doesn't really do much for bigger workloads and especially anything gaming related.